One more body was recovered Thursday from the debris of the collapsed Majerhat Bridge in southern part of the city, taking the toll in the incident to three, a police official said. The body was identified as that of Goutam Mondal (45), a labourer hailing from Murshidabad district, who was missing along with another labourer Pranab Dey since the accident on Tuesday, he said. Mondal was working as a cook in the extension of the Metro rail project going on adjacent to the Majerhat Bridge, he said. The area near the site had been dug up for the project and construction material is strewn all over the place. The other deceased, whose body was recovered Wednesday was identified as Soumen Bag. Of the 24 injured, 11 were discharged Wednesday and 13 are currently under treatment in different hospitals, he said. After Mondal's body was found, NDRF personnel left the spot, while State Disaster Management Department personnel continued their rescue work at the accident site with cranes, earth movers and drilling machines. "We are closing our operations as it seems there is nobody stuck inside, an official of the NDRF said. The state government has constituted a committee under Chief Secretary Malay De to investigate the cause of the collapse. The bridge in Alipore area runs over the Majerhat Railway station and connects the city centre with the heavily populated Behala, vast areas of the south west suburbs and neighbouring South 24 Parganas district. With the Diamond Harbour Road being closed and less number of buses plying, thousands of commuters were stuck in huge traffic jams since morning. "We have diverted vehicles to and from the city through various other roads," an officer of Kolkata Police traffic department said. The police lodged a suo motu case against unknown persons in connection with their involvement in the collapse. This is the third bridge collapse in the city since 2013. An under-construction flyover collapsed in the crowded Burrabazar area, the wholesale business hub of the city, on March 31, 2016, claiming 26 lives. On March 4, 2013, a road bridge collapsed in Ultadanga area in the northern part of the city. There was no casualty. 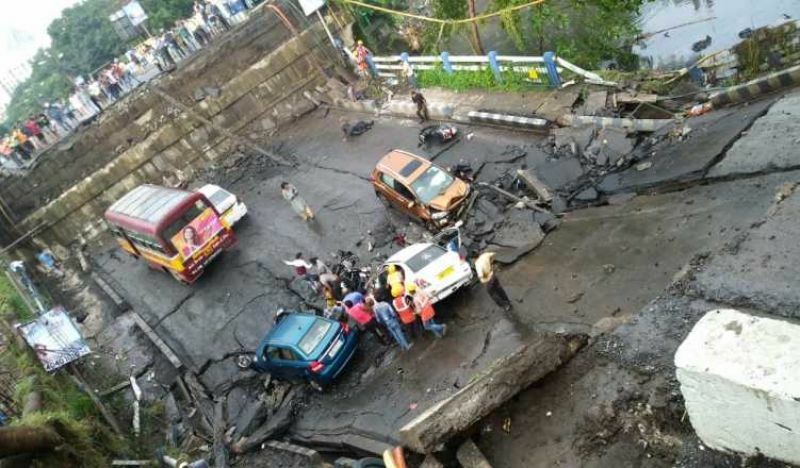 Chief Minister Mamata Banerjee, who rushed back to the city from Darjeeling Hills Wednesday, will hold an emergency meeting with the PWD and other departments and the Kolkata Metropolitan Development Authority (KMDA) in connection with collapse of the bridge.